The Massachusetts School Psychologists Association is dedicated to promote appropriate mental health and educational services to meet the many and varied needs of children, families and their communities. In order to achieve this aim, the Massachusetts School Psychologists Association advocates for children’s needs, informs the public of the value of school psychological services, provides continued professional development and conducts research. One in five school-age children suffers from a mental health disorder. Does your school have enough qualified psychologists to meet student need? 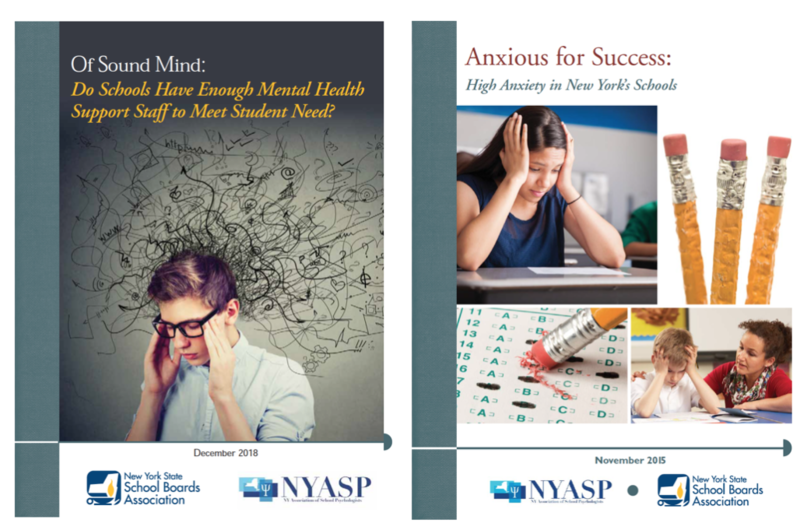 Read NYSSBA’s latest research report to learn more about what superintendents and school psychologists say about whether there are enough qualified staff to address student mental health challenges. Excessive worry. Withdrawal. Irritability. Even nausea. Since the advent of the federal No Child Left Behind Act (NCLB), high-stakes testing has been a prominent focus of schools throughout the United States – and New York State in particular. But what toll do these tests take on students who must take them? Read NYSSBA's latest research report to learn more. The MSPA Board of Directors meets monthly on the 2nd Tuesday of each month. Meetings are held at William James College in Newton, MA. All active MSPA Members are invited to attend MSPA Board Meetings! If you would like to post a job on our website please send a brief job description and contact information to our technology committee.